We don't have any trips to Faroe Islands at the moment . Located in the North Atlantic, this archipelago of 18 islands of volcanic origin, mountainous terrain and sharp cliffs, is an authentic paradise for bird watching. Some of the most common species are puffins, boobies, and endless seabirds. The best way to enjoy its untamed nature is through travelling along the traditional roads that connect the small towns of the islands. Also by boat, to hop between the islands and discover their virtually untouched environment. Although the vast majority are inhabited, it is not a popular tourist destination, so it is possible to cross the islands without coming across many people. Among the most well-known islands, where most of the points of interest are concentrated, are Streymoy, Vágar, Eysturoy, Mykines and Borðoy, easily accessible by light plane or by boat. Vágar is the gateway island, where the ferries of the archipelago arrive and from where most of the travellers depart to Tórshavn, the capital of the Faroes located in Streymoy, the largest of all the islands. Occupied originally by the Vikings, this small city was the first to become populated and retains, perfectly, its architecture of the sixteenth and seventeenth centuries. 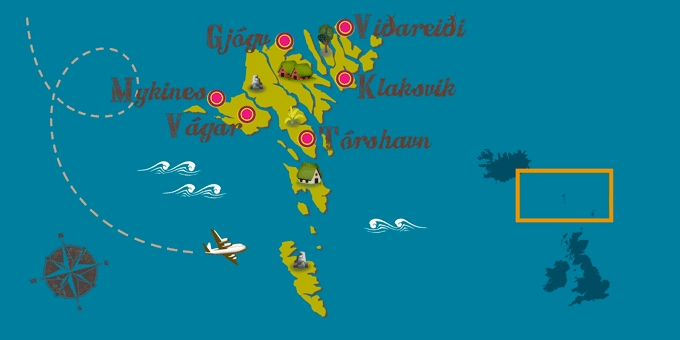 Other places of interest are the villages of Tjørnuvík and Saksun. Mykines is known for being the paradise of ornithologists, since it is home to great number of birds, some of unknown species. On a trip to the Faroe Islands, cities such as Klaksvík, located on the island of Borðoy, can not be missed either; as well as an excursion to Slættaratindur, the highest point in all the islands. If Faroe Islands has caught your attention, leave us your number so we can call you to discuss the voyage that awaits you.